Once your aquatics project is approved, you will enter the design phase for the facility. Be sure to go back to the work you did through the public process, focus groups, and surveys, and do your best to keep your promises. Some will say it has never been easier, faster, and more effective to reach customers since the creation of the World Wide Web. On the other hand, I feel it has also never been more time consuming, challenging, and cumbersome. Municipal facilities and small corporate facilities that have tight budgets may not be able to hire quality musical entertainment or performers. That’s OK, because I propose that there’s a fail-safe way to entertain your guests without the expense of professional entertainers. Aquatic Center Marketing delivers practical, affordable, and innovative marketing ideas for aquatic facilities of any type and size to increase membership, boost attendance, establish their image in the community, and reinforce the value of aquatics as an enjoyable lifelong activity. If you need to make a big impact in promoting and growing your aquatic facility, then you need Aquatic Center Marketing. 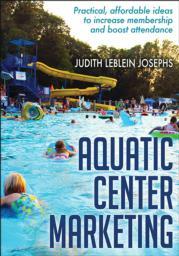 Written by an industry veteran whose novel approach to marketing has garnered numerous national and international awards, this book delivers practical, affordable, and innovative marketing ideas for any new or existing aquatic facility, of any type and size. You’ll find chapters on topics such as brand management, market development, guest communications, and how to be effective with limited funding. Learn how the design and signage in your facility can work to excite guests and keep them coming back throughout the season. Understand how to get the most out of your electronic and social media efforts and how to use fun events and themes to attract specific audiences. Then see real-life examples in case studies and stories that demonstrate the practical solutions in action. Create memorable experiences for your guests and make your aquatic facility a success. Aquatic Center Marketing isfull of realistic, practical ideas that anyone managing an aquatic facility can quickly put to good use to grow the facility and increase the bottom line. Managers and marketing personnel of aquatic centers and facilities, water parks, and aquatic clubs, as well as lakefront operators and park district superintendents. Judith Leblein Josephs has more than 40 years of experience working in a variety of roles related to aquatic facility management. She is a featured speaker at state, national, and international aquatics conferences and training seminars and has a knack for making learning a memorable and enjoyable event. After 20 years in the public sector, Josephs was with Water Technology Inc. for 12 years as their marketing and operations consultant. She has served as an operations coach for dozens of facilities of all sizes, both municipal and privately owned properties, and in 2006, she formed her own consulting business, Judith Leblein Josephs Enterprises LLC. She has clients across the country, including the City of Providence, Rhode Island, and all of the aquatic venues for the Salvation Army Eastern Territory. Josephs knew that she would someday return to the public sector, and in 2007 she was recruited by the City of Summit, New Jersey, to serve as their director of community programs. She had a role on the design team that renovated the community pool, now known as the Summit Family Aquatic Center. Recognized with Aquatics International’s 2014 Best of Marketing Award, the Summit Family Aquatic Center’s mascot, Shark Diddy, graced the cover of the magazine. Josephs’ specialty in marketing, promotions, and television and radio production has proven quite valuable to all of her employers and clients. She has an unprecedented 12-time record of winning the Speaker of the Year distinction from the World Waterpark Association (WWA), and she was inducted into the WWA Hall of Fame in 2003. In addition to numerous WWA Splash Marketing Awards and Industry Innovation Awards, she received the WWA Board of Director’s Award in 2011. She has also helped launch hundreds of new aquatic venues as the instructor of WWA’s Ready, Set, Go! A Guide to Getting Started program. Her how-to lists and articles published in major industry publications are used by aquatic operators worldwide.